View of the bridge in Newport in the Isle of Wight by J. King. Newport is located near the centre of the Island and was once a thriving port. 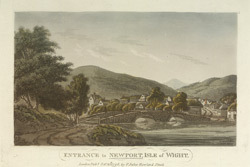 In W. H. Davenport Adams’ book ‘The Isle of Wight; Its History, Topography and Antiquities’, published in 1862 Newport is describes thus, “[it] is the metropolitan town of the island. Seated on the Medina river, in a pleasant valley, it is almost surrounded by lofty calcareous downs, whose grassy slopes are always chequered with shifting lights and shadows”.